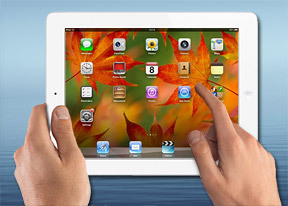 The iPad 4 features a 5 MP iSight camera capable of producing stills of 2592x1944 pixel resolution. It features Geo-tagging (Wi-Fi location on the Wi-Fi only model), touch focus and face detection. Long story short, the last two full-sized iPads are on par in the camera department. The user interface is as basic as it gets, offering very little controls outside of the virtual shutter key. Besides that, there are two toggles - one for switching between still and video modes and one for switching between front and back-facing cameras. There's an Options button too, but that hides only the grid option (it makes us wonder why Apple didn't just put a Grid button). You can activate AE/AF lock by tapping and holding on the screen but you're missing out on HDR and the panorama feature. Not that we advocate taking photos with a tablet, but Apple made a big deal out of panorama shots. Images captured with the iPad 4 turned out good for a 5MP shooter - there is a good amount of fine detail (though noise reduction takes some away) and colors are okay. The camera tends to overexpose bright areas, but that's nitpicking - you probably won't be doing much shooting with such a big tablet. The iPad 4 joins our vast array of devices in the Photo quality comparison tool. We've selected to pin it against the iPad mini and iPad 3 but you can select any available device in our database. The iPad 4's iSight camera is capable of producing 1080p videos @ 30fps. Although not the go-to device for making home movies it's still a nice addition to have. The camcorder interface borrows from the camera one - you get one shutter button, a switch to front-facing camera toggle and that's it. Videos have a bitrate of around 18 Mbps and a smooth 30fps framerate. Audio has a bitrate of 65 Kbps with a sampling rate of 44 kHz but it is mono, as with all iDevices so far. Videos are smooth and detail is good enough, though there is some grain visible. The videos are perfectly usable though not as good as the iPhone 5 produces (no surprise there). The iPad 4 also features video stabilization. It's more of a software gimmick as it is real hardware stabilization but it does remove some of the shake, which is useful when shooting video with a tablet. Here's a sample video uploaded to YouTube. And here's an untouched 1080p@30fps sample (23MB, 11s) taken straight off the device. The iPad 4 joins our video quality comparison tool, where you can compare its output quality to that of the other 1080p contenders we have tested. The tool's page will give you information on how to work with it and what to look for.